One of the biggest events in the Hastings cultural calendar is virtually upon us so prepare yourselves because it’s gonna be a big one….believe it or not, the annual Hastings Fat Tuesday Festival is in its 10th year! For events specific to the Jenny, read on…..
It’s been a while in gestation but the RX Shantymen finally have a CD of recordings of their RX SHANTYMEN – Sea Shanty Sessions, and this is the official launch. We can tell you it truly captures the atmosphere – you can almost taste the sea. And the beer. Plus, if you really need another reason to come along (and join in? ), KING SIZE SLIM will be on board to perform an introductory set. 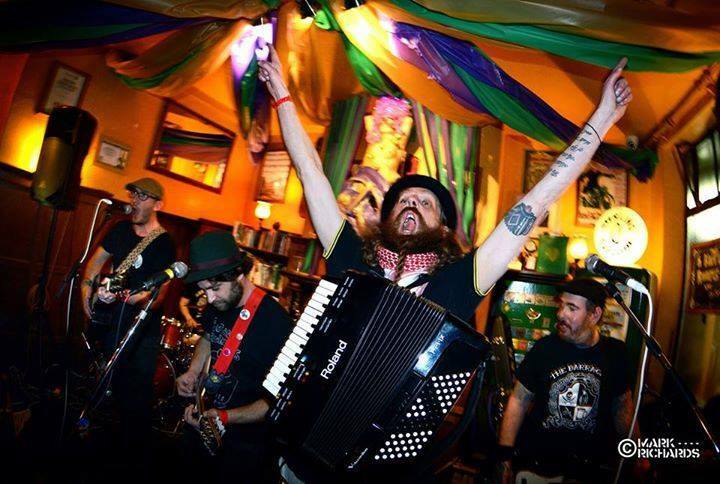 The Harry Randle-Marsh Band will be kicking off our Fat Tuesday weekend . This young, Hastings-based six-piece boasts an impressive repertoire of covers, both old and new, and originals with lashings of Funk, Blues and many other influences. 40 acts + 16-plus venues + 5hrs = 200 gigs! The Jenny Line-Up so far? After the Tour we welcome back Gentlemen of Few . BBC Radio 2 Folk Award Finalists play an eclectic blend of old-time bluegrass and classic rock, performed with a raw passion and intense energy hardly to be believed, giving them an almighty sound that they’ve coined as “Nugrass”. Jo Carley and The Old Dry Skulls return with their unique brand of Goodtime, Oldtime Country-Punk. Watch them throw Old Time Roots music, Ska and Punk into a backwoods still to make musical moonshine. It’s the Big One, the Fat Tuesday Tour – watch this space for line-up updates.